What is a patent and what are the benefits of registering it? A patent is an exclusive right that is granted for an invention. The invention can be a new product or new process, or a technical improvement to existing products or processes. This right last for 20 years from the date of filing or priority date claimed. You should register your inventions as a patent because once it is registered with the Intellectual Property Office of Singapore (IPOS), others cannot use your invention unless permission is granted. You can bring legal action agaist anyone who infringes on your patent under the Patents Act. Registering your patent opens up more economic opportunities as well; such as profiting from sales and licensing of the patent or using the patent to raise investment. In this article, lawyer Anil Balchandani explains what is required to successfully register your patent. Am I eligible to register the patent? You are a person who has entered into an agreement with the inventor before the making the invention, such that you are entitled to the invention. Can the patent be registered? A patentable invention is on that is new, is not an obvious result, and is capable of being applied industrially. Generally speaking, an invention can encompass any type of improvement over existing products or processes which have some form of practical application is patentable. Methods of treatment of the human or animal body by surgery or therapy or diagnosis, as well as inventions that are generally expected to encourage offensive, immoral or anti-social behaviour will not be published or patentable. Where should I register the patent? Patents are territorial in nature, which means you will need to file an application for patent protection in (almost) every country where you desire legal protection. Applications for patent protection can be done via a domestic; or a national phase entry using an international application. 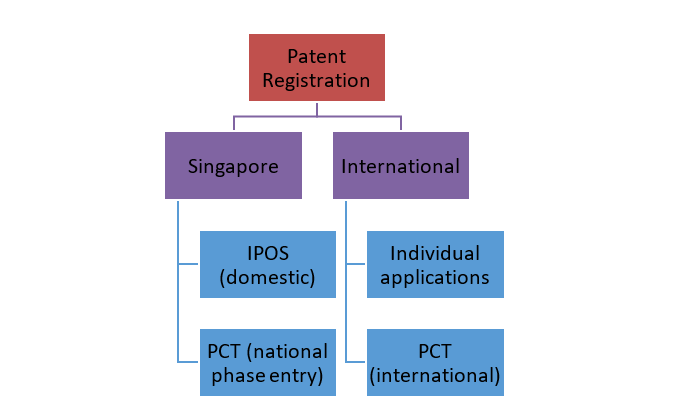 For example, if you wish to protect your patents in Singapore, you can either apply directly through the IPOS via the domestic route, or through Patent Cooperation Treaty (PCT) national phase entry route. If you wish to protect your patents in other countries, you can either file individual applications in the countries concerned, or through PCT which facilitates the filing of international applications. Singapore residents are required to obtain written authorisation from IPOS before filing a patent application overseas. Failing which, you may be guilty of an offence under the Patents Act. How do I apply for a patent in Singapore? *Note for Stages 1 and 2, you are required to submit any documents that are lacking within 2 months of notification. 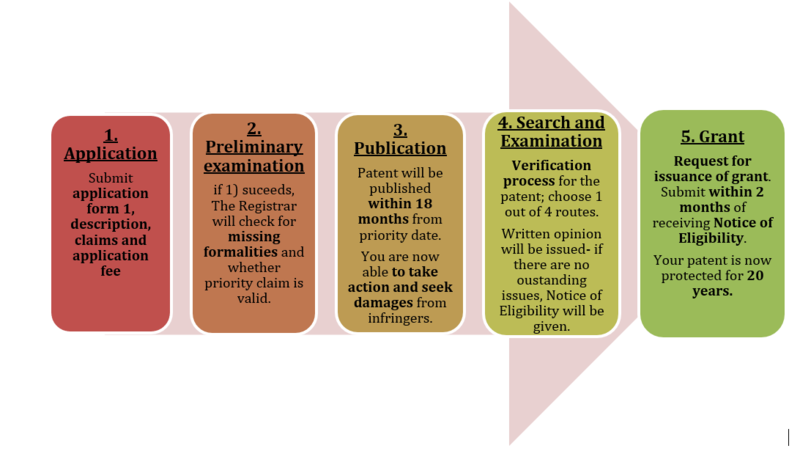 For Stage 4, you are to resolve all issues within 18 months of the first written opinion, and for Stage 5, you are to submit the request for issuance of grant within 2 months of receiving Notice of Eligibility. If you fail to do any of the above, your application will be seen as abandoned. If the claims are not fully ready at the point of filing the patent application but you wish to secure an early Date of Filing*, you may consider filing a provisional application. This means that you are given an additional 12 months to complete the application process (i.e. to file a non-provisional application), and your patent (if granted) will be protected from the Date of Filing. *The Date of Filing is the date from which your patent is protected. If there are documents or information that is incomplete or missing at this stage, the Registrar will notify you to amend it within 2 months of the date of notification, failing which the patent application will be treated as abandoned. The Registrar will conduct a preliminary examination on your application. This is conducted after the filing fees are paid (this can be done within 1 month of filing the application), and when the claims are submitted within 12 months of the priority date or filing date (whichever is earlier). The preliminary examination ensures that there are no lacking formalities requirements and the priority claim is valid. If there are any requirements at this stage that are not complied with, the Registrar will notify you to amend it within 2 months of the date of notification, failing which the patent application will be treated as abandoned. Details of the patent application will be published on the Patents Journal as soon as possible within 18 months from the declared priority date or filing date if there is no priority date. You may request for early publication of the patent application through the Patents Form 9, if you wish to have your patent granted in less than 18 months. Once the patent application is published on the journal, it is open for public inspection. If you wish to keep your invention a secret, you would have to withdraw the application through Patents Form CM9. Once the patent application is published, you are generally able to take action against infringement of the patent and seek damages against the infringers. Each patent application will have to go through a ‘verification’ process. This involves a search for prior art, and then examination of the claims against the prior art. A search for “prior art” is one where are similar inventions in the same field as your patent application, and then to determine if the prior art destroys the novelty of your patent application, amongst other criteria for granting patents. You can choose one of 4 search and/or examination routes, depending on the availability of a foreign search and/or examination results and cost. A detailed table comparing the routes can be found on the IPOS website. An overview of the deadlines to request a search, an examination a search can be found on the Patents Infopack page 26. After the search and examination process, a written opinion on the registrability of your patent application will be issued. Subsequent written opinions (except for supplementary examination) may be issued until all outstanding issues surrounding the patent application is resolved. If the outstanding issues cannot be resolved within 18 months from the date of the first written opinion, you will receive a Notice of Intention to Refuse from the Registry of Patents, meaning your application for the patent is refused. You must file for a request for the issuance of the Certificate of Grant using Patents Form 14 within 2 months after receiving the Notice of Eligibility, failing of which the application will be treated as being abandoned. If you have made any amendments to the original specification, you need to submit a set of consolidated specifications together with the request. Once the request is filed and the conditions for grant are satisfied, the Registrar will issue the Certificate of Grant and your patent will be protected (for a total period of 20 years from the Date of Filing or priority date (whichever is earlier). To obtain continuous legal protection for your patent under the Patents Act the patent is to be maintained by paying renewal fees, starting from the 5th year. The PCT is administered by the International Bureau of the World Intellectual Property Office (WIPO). It is an international treaty to facilitate patent protection for an invention in several countries simultaneously through one application with a single office. For international applications, you can file for the patent through the PCT portal, ePCT. Within 30 months of the international application, you can apply for it to be protected in Singapore, therein commencing the national phase. To request for entry into the national phase, you need to submit the Patents Form 37, and an application fee of S$200/-. If there are requirements that are not complied with, the Registrar will notify you to amend it within 2 months of the date of notification, failing which the patent application will be treated as abandoned. Subsequent steps- Search and Examination as well as the Grant, is the same as the domestic application as stated above. 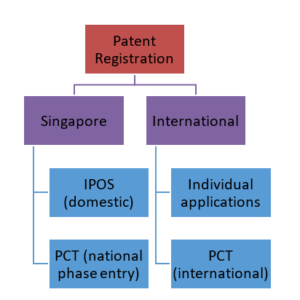 How long does it take to register a patent in Singapore? If there are no objections and you follow the specified time limits for actions, as well as all the requirements stated here are met (such as filing all the required Patents Forms and having a favourable search and examination report), a patent can be granted within 12 months from the filing of the application. There are also accelerated programmes for certain types of innovations or for patents already registered in certain countries, which may speed up the process. Otherwise, depending on the complexity of the invention, it may take about 2 to 4 years for a patent application to be granted. Do I need a lawyer or a patent agent? It is not a requirement in Singapore to engage a practising lawyer or a practising registered patent agent before an applicant can apply for a patent. However, an applicant can engage in their services given that the patent applications contain technical and legal documents that should be carefully drafted in order for it to be granted the intended scope of protection. Furthermore, failure to comply within certain time periods within the patent application process may result in negative consequences. A lawyer or a registered patent agent can give advice on the making of any pre-application disclosure and on the patentability of an invention, conducting searches on existing inventions, drafting of the patent specification and prosecuting the patent application before the Registrar. Need legal advice on patent registration? Get a Quick Consult with one of the practicing lawyers in our network for a transparent and flat fee from $49. 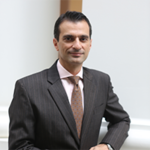 You can also request a quote with Lawyer Anil Balchandani. You can expect a call back within 1-2 days on the phone to get legal advice and have your questions answered. This article is written by Lawyer Anil Balchandani from IRB Law LLP and edited by Janice Jiang from the Asian Law Student Association.